Nursing students Krystal Morrison, left, and Lianne Jones, right, are among 17 students in Ghana until mid-March for practical experience in that African nation's rural health care system. 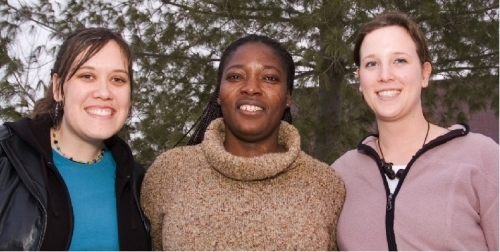 Vida Yakong, middle, is a former nurse practitioner from Ghana currently pursuing a Master of Science in Nursing degree at UBC Okanagan. Although they were half way around the world in Ghana, Africa, a team of 17 Bachelor of Science in Nursing (BSN) students from UBC Okanagan shared their six-week learning adventure in February and March with people back home in the Okanagan via the Internet. A weblog (blog) site was created by Grace Fahrun, Clinical Assistant with UBC Okanagan's School of Nursing, allowing the students to document their experiences as they completed their fourth year of study with a journey of discovery. Working alongside graduates from Ghana's University for Development Studies (UDS) Nurse Practitioner program, the students served in hospitals, community placements and rural and remote clinics. "The blog has all our bios, and we're adding our journals – how we're feeling, the experiences we have and what we've seen, and where we've been," said BSN student Lianne Jones. "It's a place for us to thank all those who have donated and helped, and it is a way for our families and friends to see us and respond to us. They can tell us how cold it is back home." Ghana offers a very different nursing environment. There, nurse practitioners do a lot of the things a doctor would do, said Vida Yakong, a former rural nurse practitioner from Ghana now studying for her Master of Science in Nursing degree at UBC Okanagan. "From diagnosis to treatment, it's much more empowering. You can impact the community members, helping people to manage their own health care." Assoc. Profs. Fay Karp and Susan Van Den Tillaart accompanied the students on their six-week trans-cultural trip. "This is always an exciting semester and it is a pleasure to watch the students developing the finishing touches on their nursing practice," said Karp. There's a strong nursing connection between Ghana and the Okanagan. In 1998, UBC Okanagan School of Nursing Director Joan Bassett-Smith (at the time head of the former Okanagan University College's School of Nursing) received funding from the Canadian International Development Agency and the Association of Canadian Community Colleges to help UDS create a program in Northern Ghana to train registered nurses to work as rural nurse practitioners. Since then, more than 60 nurses have graduated from the program, says Bassett-Smith. "The program is now run by UDS and several faculty for the program have had the opportunity to study for their Bachelor of Science in Nursing degree here at UBC Okanagan," she said. "The Nurse Practitioner program will now move to becoming a BSN degree -- a move that has the full support of nurses working in the area, UDS and the Ministry of Health for the Northern region." UDS is the only post-secondary institution in West Africa with a development focus and serves the poorest regions of Ghana. The goal of rural nursing is to help educate the population, implement primary health care and decrease mortality in a region of the world where some of the leading causes of death -- such as malaria and measles -- are preventable. Over the past eight years, several Okanagan nursing students and faculty have visited Ghana, but this year's group is the largest ever to make the journey. Before leaving, they raised almost $2,000 in cash and more in donations of medical supplies from the Okanagan health care community. "We received a lot of gloves and perinatal supplies, orthotics – leg braces for children, for example – and medications," said Jones. Karp, who taught in the UDS Nurse Practitioner program in 2000 and 2002, said the care package would be "received with joy and put to good use in northern Ghanaian clinics."